which counts the number of artists, and separately, number of albums, Magnatune has for each genre. I don't know which way the correlation runs -- it may be that we attract albums in the rough proportion we well, or that we sell about an equal average number of each album, and thus more albums in one genre means more sales. 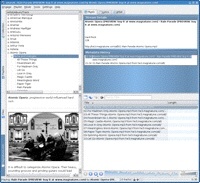 A movie of this Micro Browser from http://magnatune.com/microbrowse is visible on the right. a Bitty Browser for this URL is available here. 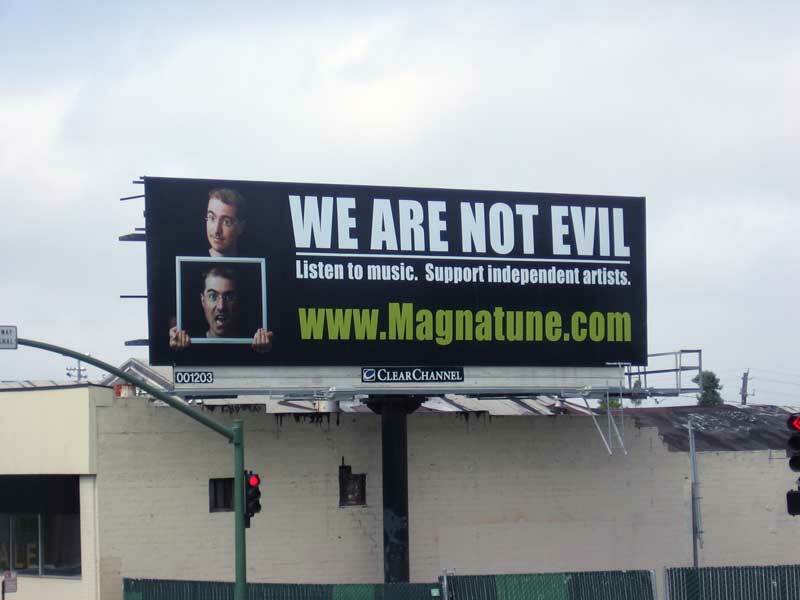 Magnatune musician Chris Juergensen has been doing a lot of outreach to podcasters, and tells me that he's getting a really positive reaction and lots of good results. He suggested to me that he'd be happy to write a "how musicians can self-market their music to podcasters" and I agreed, that this would be an excellent idea. Podcasters are looking for podsafe music for their podcasts and this offers you a cost effective method to market your music. 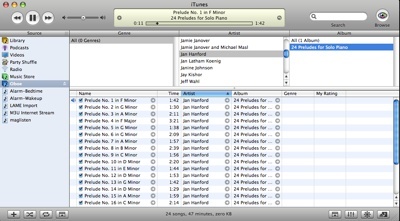 Podsafe music, by the way, is music that they can legally play without having to pay a performance royalty. Keep in mind, by offering your music royalty free to a podcaster, this does not mean that your music is royalty free for anything and everything, only for podcasters. Being signed to Magnatune, your music can already be used free of charge by podcasters but there are some simple steps that you can take to help get your music included in podcast programming. With a little bit of time an effort you may find yourself being promoted all over the world. First off, let me explain a little bit about what a Podcast is. Podcasts have only been around for a few years yet millions of people have heard one. Basically podcasters create a thirty-minute to one-hour internet radio program that can be downloaded and listened to at the listener's leisure. A constant internet connection is not necessary. A podcast can be listened to directly from ones computer or from his or hers iPod. 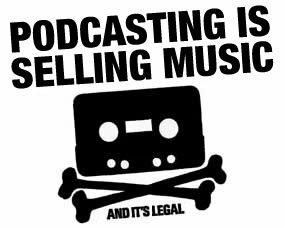 As I said, podcasters are looking for podsafe music, music that can be broadcast without having to pay a royalty. One would assume that both the paperwork and the financial obligations of playing music that is not royalty free is a hindrance. Regardless, podcasters are not looking for typical commercial music. They are looking for new music, music that their listeners have not heard before. Let's face it; if the listener wanted to hear platinum selling hits, they would prefer FM radio. They want your music but may not know where to find it. The main site that offers royalty free music to podcasters is the Podsafe Music Network. You can upload your music free of charge and when a podcaster finds it, listens to it and decides that he want to play it, can download it and use it on his podcast. He will also most likely link to your site, a form of proper internet etiquette. I would suggest that you go to the Podsafe Music Network site and upload your music as soon as possible. Although the Podsafe Music Network offers a very valuable service free of charge, there is one drawback for the podcaster, and this is where Magnatune comes into the picture. You see, any artist regardless of the quality of his or hers music can use the Podsafe Music Network as their distribution tool. What this means is that the podcaster has to sift through a lot of music to find what he feels appropriate for his podcast. In my various communications with podcasters all over the world, I generally get the sense that they are frustrated with the amount of effort it takes to find music that they feel works for their podcasts. This is why Magnatune is perfect for podcasters. Magnatune has taken care of this problem for the podcaster. As you know, you as a Magnatune artist were picked from hundreds of submissions. John Buckman filtered his artists to make sure a minimum standard quality exists. Feel confident that your music is high enough quality for the podcaster. I must stress however, as an independent artist you must be proactive in your efforts, do not wait to be approached, do your own research and submissions. - Include his name; you will most likely have to listen to the podcast to make sure. "To Whom it may Concern" works fine for the "commercial music business" but not here. - Explain who you are and what your music is about. - Explain that you are signed with Magnatune and that your music is free of charge to him for his podcast. Give him the login information for downloading your music from magnatune. Explain that he can download MP3s or WAV files. If you don't know the login information for your music, e-mail Magnatune and get it. Include it in the e-mail. - Explain to him that other Magnatune artists are also available free of charge to him and that all the artists are hand picked from submissions. I actually suggest a few artists other than myself. - Offer to link to his site form yours and to include any podplay in your newsletters. - Attach an MP3 also. He is more likely to listen to this first before deciding whether or not to actually download your entire CD. If you don't have an MP3, download it yourself from Magnatune using the same login information as above. I received prompt and courteous replies from every podcaster I submitted my music to. Yes, every single one. I am confidant that if I sent a CD and letter to every commercial radio station in the United Sates, I would still be waiting for replies that would never come. And have been included in every podcast that I have submitted to, with the exception of one (who may include me in a future podcast). If the podcaster plays your music, thank him from the bottom of your heart in a follow up e-mail. Remember, podcasters and independent musicians must work hand in hand for both to be successful so treat the podcaster in a respectful manner and value your relationship with him. The "WE ARE NOT EVIL" billboard is now up in Oakland, California, at the intersection of 51st and Broadway. This is a busy intersection, so I'm quite pleased to have it. My thanks to Clyde Jones for the photos. that I think is absolutely brilliant. I've put this graphic up on our podcaster's page at http://magnatune.com/info/podcast and would like to encourage all podcasters to use it on their web sites. It makes a great point! 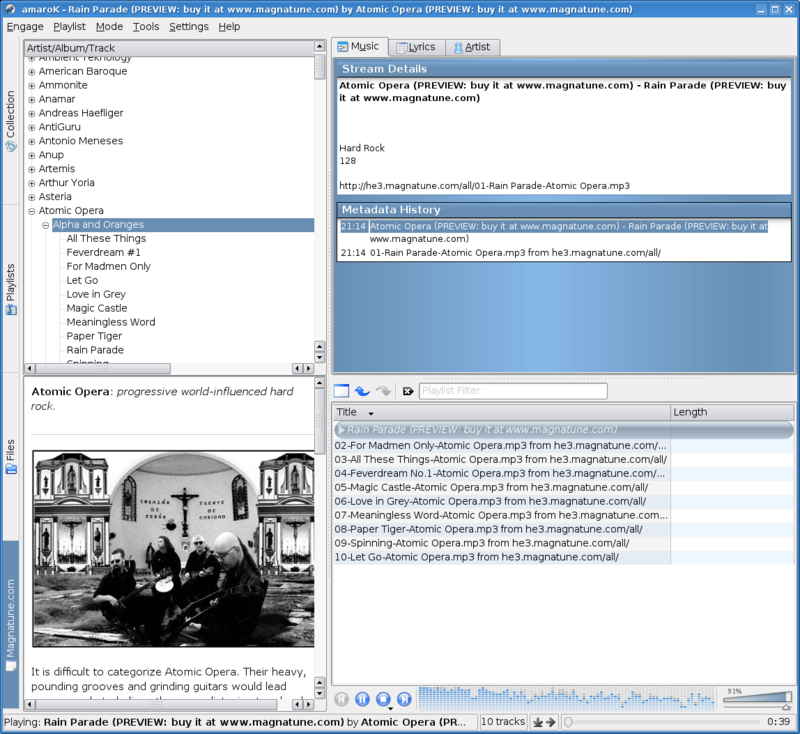 A few days ago, Nikolaj Hald Nielsen emailed me to let me know that he'd managed to embedded the magnatune catalog into the Linux media player amaroK. A picture of his work is above. He also asked if there was a way for amaroK to purchase and download the music entirely within amaroK, much like how iTunes music store works. To enable applications to order music from Magnatune, I've made a REST/XML api that any application can call to order a downloadable album via credit card. This url procedure allows your software to purchase music directly from magnatune, and receive all the download information back as an XML document. This is useful if you are embedding the Magnatune catalog inside your application, and would like to let people purchase music directly from within your application. If you so wish, your application can also download the purchased music on the person's behalf. id= field, which is your partner id. Contact john to obtain one. I'm off to Munich this weekend, to pick up a renaissance lute made for me by Andreas Holst. I'm also in Paris again in a few weeks, and then in September, doing a 3 week European press tour with Weedshare impresario Steve Turnidge, driving from Paris->Luxembourg->Saarbrucken->Berlin->Munich->Dijon->Paris, with lots of side trips on the way. Anybody interested in meeting up with me in any of these places, drop me an email on my [email protected] address at magnatune.com and we'll hook up. Below is a map of my currently planned itinerary in september. 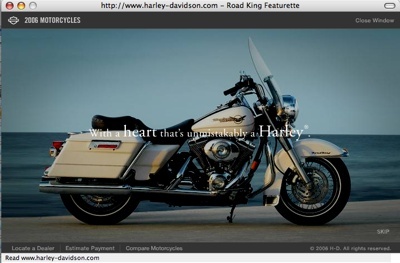 Harley Davidson motor cycles has licensed music from Magnatune artist Seismic Anamoly http://magnatune.com/artists/seismic_anamoly to promote their new Road King motorcycle. The first image on the upper left side will be advertising the Road King....click on it....a new window will pop-up....that tune you hear in the background is my song "Santa Rosa Shuffle"....it ain't but about a 20 second clip but By God it's MY TUNE....on HARLEY'S MAIN SITE!!!! Man, I'm honored....to have a song chosen by THE Premier motorcycle company in the World....I'm knocked out. HUGE THANKS to MAGNATUNE.....John and Jan....MY PROMOTERS....they are the BEST!!!! I'm trying out the Oboe mp3 locker service from mp3tunes http://mp3tunes.com as I'm working on an mp3tunes/magnatune partnership with mp3tunes CEO Michael Robertson, and I want to get better acquainted with how Oboe works. I put all of magnatune into my Oboe locker, so that I could access it from iTunes when I'm traveling. 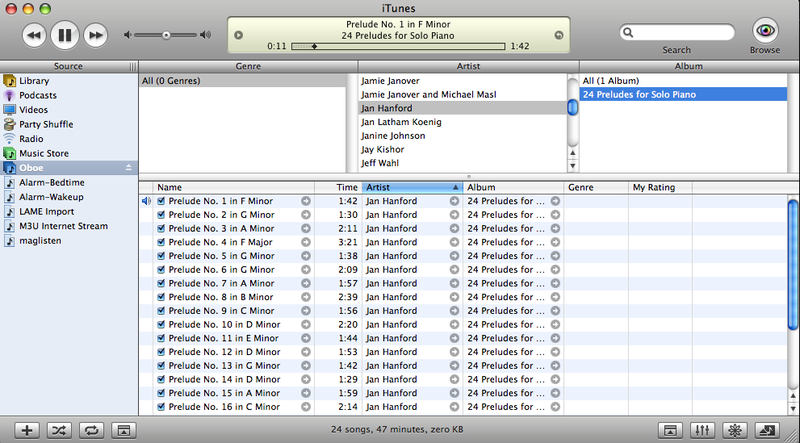 I'm in Paris currently, with good quality WIFI in my hotel room, so I'm listening via the iTunes/Oboe plugin. Plus, as we add more albums to Magnatune each month, Oboe picks up the new stuff and uploads just that, which is very handy. It works really well, with the only problem I've found is that the mp3 genre isn't passed through to iTunes (you can see that in the screen pic above), something they told me they're going to fix. Otherwise, it works like a charm. Next up for Magnatune/mp3tunes is providing all of magnatune's 128k mp3s through their sideload http://www.sideload.com/ service so that more people can discover magnatune's music. Back in the end of February 2006, Magnatune licensed music to Renault, which they were going to use to publicize their new car, the "Nouvelle Megane". The web site for this is now up, and the music available on the web site and the car. What's the association between mp3s and a car? Well, this new model from Renault comes with a built in mp3 player, and they wanted to have an album's worth of music included with the car. 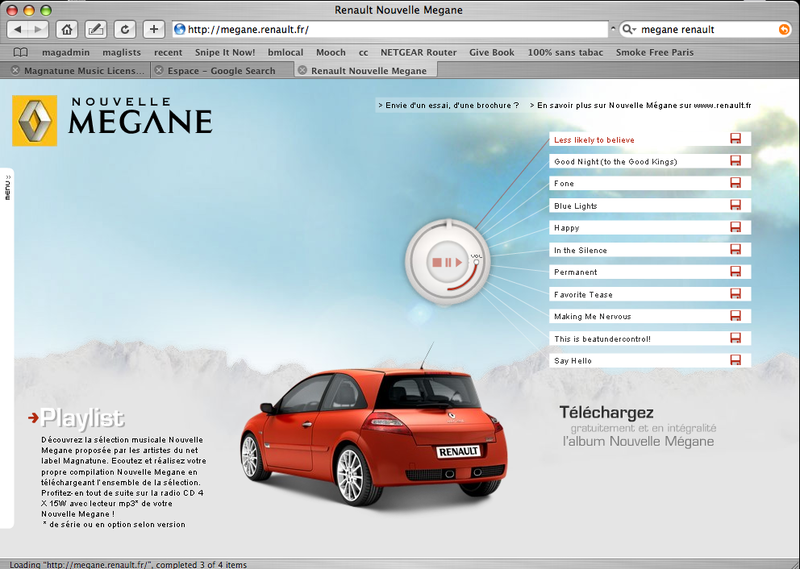 So, you can listen and download "L'Album Nouvelle Megane" from their web site, as well as listen to it when you get your car from Renault. A nice perk, I hadn't expected, is that the Renault web site explicitly names Magnatune as the source of the music (not required with a paid license).